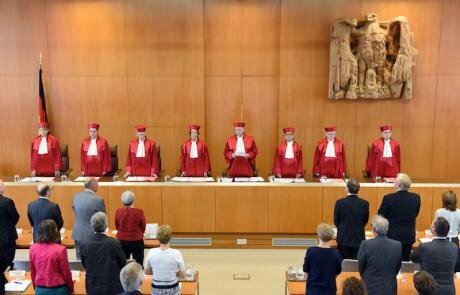 The first senate of the German Constitutional Court (Bundesverfassungsgericht) in Karlsruhe (Baden-Württemberg), 2015. Uli Deck/Press Assocation. All rights reserved.One of the goals in DiEM25’s Progressive Agenda for Europe is to initiate a constituent process – to imagine a democratic pan-European constitution and the process that may lead to it. We’re already making good progress in this long enterprise, with the conversation well under way amongst members across Europe. In this two-part series, London DSC member Sam Hufton shares his thoughts on such a constituent process as a contribution to our conversation. Sam looks first at why Europe’s existing treaties are failing its citizens… and then at how the European idea can be saved. Here’s part 1. The problem with founding a constitutional order on the basis of treaties has been amply discussed by observers of the European construct for decades, and from the crucial decade of the 1990s in particular. Chief among these concerns is that in reality, treaties are international law. Treaties are drafted by ministers of state and diplomats and not by the people to which they will apply; it is the states rather than their citizens, who are the ‘High Contracting Parties’. The result of this is the fact that in our political discourse and in law they do not carry the same weight as a real constitution. In European politics, the treaties are not referred to as the authority defining or guaranteeing our rights and duties to one another, nor as an example of our common involvement in and control over the Union – because they are not. They are creatures of intergovernmental conferences, not citizens’ politics. Related to this is that the treaties lack the democratic legitimacy of constitutional law. By making the member-states the ‘Masters of the Treaties’, the people are explicitly cut out from the pouvoir constituant, having only an indirect influence over the treaties’ content. In theoretical terms, we can say that the treaties effectively fulfil the material role of a constitution, as defined by Fossum and Menéndez, but not the formal or normative roles. Specifically, the Union does not have a normative constitution understood as a democratic constitution; the Union and its founding documents do not fulfil or attempt to fulfil the highest standards of democratic legitimacy. Instead, there are a series of legal norms and practices to which reference is made as fundamental in the integration of the political community. These are not formally recognised as a constitution; they nevertheless act in the functional, material sense as a constitution, in that they govern the functioning of the Union. One of the most common assumptions about constitutions is that they are intrinsically linked to states. This could be taken as one reason why the founders of the Union chose to use treaties between states rather than any document written by citizens or democratic representatives of citizens. Even those proposals by such representatives (drafts from 1953, 1984 and 2004) were all proposed as treaties. While on the one hand it doesn’t seem necessary to tie a constitution intrinsically to a state, the link is important, in that a state is a powerful tool of democracy. More importantly, the Community exercises the sovereign power of a state; as Grimm argues, rather than the state which exercises it, it is sovereign power itself which requires legalisation and legitimisation by a constitution. In legalising and providing rules governing the Union, the treaties fulfil their role sufficiently. However, they are insufficient as a source of legitimisation for sovereign power, as 1) they are not formally recognised as such (providing legality but not legitimacy), and 2) they are not informed by the norms of our society, particularly democracy, to the extent that they should be (the law has not been established democratically). Democratic legitimacy requires a political community to reconcile its material and formal constitutions so that the latter reflects the former (and continues to do so) – so that the real rules and norms of political life are given formal status in a document. The democratic establishment of law is achieved when there is a ‘master document’ of which the citizens are authors; authors who determine those rules and norms. A constitution provides legitimacy for the exercise of sovereign power through its democratic legalisation; it is distinct from treaties in that it is formal and informed by the norm of democracy. The key to the legalisation of sovereign power by means of a constitution is that it is citizens who deliberately and actively author the document, rather than their governments, placing the democratic process at the foundation of the governing order. In short, ‘The legitimation of rule by those subject to it’; something treaties are explicitly unable to achieve. The basis of the argument is the existence of a constitutional legal order in Europe without any underlying constitutionalism – a ‘constitutional culture’, which stems from the normative constitution. Effectively, the reason for the existence of the European legal order, the basis of the decision to construct one and the process towards that decision, do not exist. There are several elements on which to base a European constitutional order: democracy would be one; transnationalism, another. Treaties are unable to provide the necessary basis for a constitutional culture; they do not recognise citizens as free and equal - the basis of democratic society - but states, which control the drafting of the treaty. The states drafting the treaty is the equivalent of the rulers drafting the constitution, rather than the ruled. Those citizens have not collectively agreed to a process of mutual justification of political action, cooperation in government and the exercise of power. The treaties do not recognise the citizens as the constituent power, and hence, are not and cannot be informed by them and their discussions. To clarify; we are bound by a material constitution (represented by the treaties), which governs the rules and norms of European public life and to some extent national public life. Europeans are subjects of community law as is the case in no other international legal regime, where, as Weiler points out, even the participating states and governments rarely act like subjects of the law. However, this constitution has no status or underlying ethos: the ideals and norms within it firstly do not adequately reflect those ideals and norms within our national constitutional structures, they are not the product of a democratic discourse – hence, democracy is not among them – and they have lastly not been enthroned as the Constitution of Europe. In effect, European citizens are subject to law, the basis of which, they did not authorise or discuss. The result is the absence of legitimacy necessary to underpin such an order. A Europe of treaties has allowed the creation of an entity which none of we citizens recognise as ours. It is characterised by market-fundamentalism, austerity, authoritarian memoranda of understanding, callous refugee deals with Turkey; a complete absence of solidarity. This is Hayek’s Europe of no democratic control and unfettered markets, where all decisions are made beyond the sight and control of citizens, and our enslavement to our economic conditions becomes an immutable fact of life. The undemocratic vision of a soulless ‘interstate federation’ has been established over the heads of citizens and their democratic politics and there is no one there to be held accountable for it. Treaties take place outside of democratic politics; they are divorced from it, just as prescribed by the interstate federation. The justifications have been peace and economic prosperity; laudable goals yes, but not when used to distract in a bread-and-circus fashion from the absence of democratic self-government. A Europe of treaties.. is characterised by market-fundamentalism, austerity, authoritarian memoranda of understanding, callous refugee deals with Turkey; a complete absence of solidarity. There has been some desperate rearguard action in this regard in an attempt to defend the existing construct without conceding the crucial battle that would suggest its defeat. The judgements of the German Bundesverfassungsgericht on the Maastricht and Lisbon Treaties have tried to describe the Union as an international order precisely because of the absence of the democratic process in the drafting of the treaties, and with it, the absence of the democratic norm within them. The argument that there is no European dêmos, and with that, that there can be no European democracy, is supposed to lead us to the conclusion that there can be no constitution and thus the Union is an international construct. The result is that our normal democratic standards need not apply. Some of the Union’s top lawyers have adopted, whilst not the entirety of the Court’s argument, the idea that the democratic standards we hold as fundamental, do not have to apply to the Union, and hence we should ‘try and continue to imagine new and specific democratic controls over the EU’s actions’. I think ‘new and specific’ here can clearly be understood as ‘weaker’. Another result intended by the Court is that the Union reins in the constitutional construct and with it integration, so that the cracks in the edifice they are desperately trying to cover up do not become too large to ignore. However, this has not happened. Other forces have been allowed to run far ahead of what constitutional courts can control; the aforementioned interstate federation is now progressively infiltrating all aspects of the Union. Comitology and the surrounding ‘infranational’ process takes place outside of democratic controls and has not been addressed after successive treaty-revisions. The treaties are not the source of these problems however; they are the enabling apparatus. They give a platform for politics to take place above citizen-led democratic politics and they justify the lack of democratic control over the processes and institutions of the union. They have created a Europe which rules through the abrogation and nullification of democracy. In DiEM25, we are committed to l’idée européenne, and the European ideal. The idea of a united continent where nations once divided by war and borders now coexist within and cooperate on the direction and purpose of a common political community. The ideal of a political community that is democratic; that is peaceful; that is post-national and post-imperial; that truly embodies the universalist values developed in the Enlightenment which spurred our ancestors on to the overthrow of Europe’s ancien régime. One which at the same time preserves, recognises and appreciates the intense levels of diversity and difference which makes Europe distinct from other parts of the globe; where that diversity of culture and opinion is taken as a value in itself to be protected. One which reconciles ‘Eros and Civilisation’. And yet no international regime has the power or can have the power over citizens that the European Union has. Europe is currently an international regime without a mandate and, with that in mind, the legal order that exists must be constitutionalised, through democracy and a formal and normative document which is our constitution. Ideological mantras cannot be allowed to govern this continent without contestation. The democratic norms which serve as the foundation of our society must be brought into the European constitutional order, through a real constitution as the very bedrock of democratic government. Treaties cannot fulfil this role, the crucial role of the social contract. Treaties are contracts between often unequal powers; a constitution is a contract between equal citizens in the formation of their common government – that is, a common desire to rule themselves. The principle at the heart of the Democracy in Europe Movement is that the European Union needs democracy as one of its fundamental norms in order to survive and be legitimate. Its material and formal constitution must be informed by this normative idea. For this purpose, the treaties are no good. To say that Europe’s citizens are the authors of the treaties because they can veto the result is dishonest; they can neither specify which parts of the Treaties they dislike nor amend them themselves. Instead governments have to interpret their intentions, and without having been given a mandate to do so. It would be foolish to argue governments in Europe are elected on the basis of their stance and negotiating strategy towards the Union. The treaties and the process which creates them therefore must be replaced by something which does symbolise democracy, through existence and process; which is directly informed by it. This is the purpose of a constitution: to overturn this treaty-based international order which has been forced upon us and yet justified by ends we do sympathise with. In essence, the problems of the so-called ‘Constitutional Treaty’ are all the problems of the treaties, however made worse by the deception inherent in the spurious use of the term ‘constitution’. Given the chosen process and stated intent of the European Heads of State and Government who called for the treaty, it seems clear that the word ‘constitution’ to give definition to this document is plainly wrong. The combining of the use of the terms ‘Minister’ and ‘laws’ in reference to European legislation (rather than Directive or Regulation), alongside historical imagery of constitutionalism (the ‘Convention’ and Philadelphia) ramps up the extent of the confusion to severe levels, given that transformation from essentially a confederation with a centralised bureaucracy to a real federal union was never even entertained among the objectives of the treaty. Jean-Claude Piris explains this baffling use of terms as a concession to the federalists in the Convention and among the national governments, who wanted the treaty to go further than a mere polishing up of the treaties. He concedes that the use of ‘constitution’ for a document that is plainly not a constitution in the historical normative sense, is confusing and undermined public understanding and acceptance of the document. However, this still doesn’t fully explain the use of ‘constitution’. When looking at the Laeken Declaration, the document calling for a ‘Convention on the Future of Europe’ and a revision of the treaties, it becomes clear that the misuse of the term constitution by the European political classes surfaces from the very beginning, as well as more general misunderstandings of the role, purpose and expectations of the edifice that they had constructed. The Declaration begins with a lot of self-congratulation, talking of the Union’s democratic legitimacy, fair distribution of economic development and general success in maintaining stable peace internally. The first is, as we’ve discussed, plainly false and the second leaves much to be desired. However, it is following from this, that the general divorced perspective of the authors of the Declaration becomes clear. Despite the open talk of democracy, it never arises that the Union itself should actually answer to the citizens. There are lots of changes to the institutions mentioned, but none of them really involves placing the institutions at the service of the citizens, in the name of whom they were supposedly established. Two problems arise from this. The first is that Europe’s political leadership assume that the Union is supposed to satisfy its citizens as a business satisfies its customers; it should divine their needs and wants and use its expertise to provide for them as best as it can, seeking token approval and ratification every so often as a marker as to whether it is doing a good job or not. This is what van Middelaar has termed the ‘Roman Strategy’ of gaining legitimacy; that is, the strategy used by the Roman Empire after it abandoned its republican heritage. Instead, it focused on providing goods, social and public or otherwise, to its ‘citizens’, as a replacement for any common identity or democratic government. Citizens have called for strategies, they want solutions; they have wants and politicians satisfy them like a marketplace - effectively the liberal-individualist theory of democracy advanced by Schumpeter. In other words, the official fin-de-siècle, ‘bread-and-circus’ version of politics, desperately trying to satisfy a deeply unsatisfied and disempowered citizenry. This is the language in which the Declaration’s framing of democracy is delivered. The second issue is that Europe’s politicians cannot conceive of a democracy that is transnational. In their statements that the Union’s institutions must improve without actually fulfilling the democratic purpose of answering and being directed by the citizens, I see the assumption that democracy can only work with an ethnically-homogeneous national dêmos. This is the interpretation of the Bundesverfassungsgericht in Karlsruhe and is the lesson learnt from the disintegration of Yugoslavia. The idea that a dêmos can be forged through the use of democratic institutions and conduct of the democratic process alone, underpinned by citizens with a respect for real democracy, is alien to them. In using the term constitution, therefore, the European elite meant it only in the material, functional sense; how do we codify clearly the procedures and practices of the Union? We might also think they intended to make this a formal arrangement, however, the fact that this is still a ‘Constitutional Treaty’ undermines this; we are still talking in international law. Crucially however, in the absence of a reconciled formal and material constitution without a democratic, deliberative process, we are lacking the normative element which makes a constitution legitimate and gives it its legitimising power as the foundation of a sovereign government. Hence, we must also conclude that the convention itself was misnamed, it being a mere advisory rather than decision-making body as in the US, 1787. The aforementioned Piris, legal advisor to the Convention and subsequent Intergovernmental Council, has put forward a comprehensive defence of the treaty and its nature. It rests on a few major elements: that the constitution was not intended to transform the Union into anything notably different from what it is; that a simple constitution is impossible due to the Union’s nature; and finally, a certain understanding of democracy that enables the Union to in large part escape criticism – one that I would thus criticise as unrecognisable to any true democrat. On the first point, Piris argues that the real purpose of this exercise, rather than transformation, was rationalisation; that is, rationalisation of the legal morass that is the treaties. To that end, the constitution effectively cuts the 2800 pages of legal language down to around 200 pages in a single document, not including protocols and declarations annexed to the treaty. Theoretically, there would be just one constitutional treaty rather than 17; in addition, the ‘pillar-system’ would be abolished, a single legal personality would replace the previous 3 and the 15 legal instruments used by the Union would be reduced to 6. Given this, Piris concedes it may have been confusing to citizens who saw this as a constitution when in reality it changed little of substance in the document. He writes himself "no fundamental changes are made to the substantive content of the present text of the treaties". Instead we talk of restructuring, simplifying and streamlining; an exercise in legal precision and intricacy. If we look at the Laeken Declaration, this can certainly be discerned, even as the attempt is made to give a sense of momentousness to the event. Nevertheless, the glossing over of the false use of ‘constitution’ is unsatisfactory. This is not merely an unfortunate word choice, the one moment when the sophistication and precision slipped, but a deliberate choice to cannibalise a concept which had no place in the process conducted after Laeken. This is worsened by the fact that the attempt to reduce the complexity to comprehensible levels fails to materialise. Piris asserts that a ‘pocket constitution’ like the US or even German constitutions would have been impossible. This he puts down to the unique nature of the European Union as a complex instrument of ‘multi-layered government’ - though certainly not a federation. In fact, if the EU were a straightforward federation it could follow the more well-known and better understood precedents of federal government. Instead, Piris is adamant, the EU is totally unique – sui generis – and so it requires a much longer constitutional text, so that the governments can precisely control what the Union institutions can and cannot do. That this assertion does not hold up, and what’s more is damaging to the Union as a whole, ties in with the specific concept of democracy used by Piris and others to absolve Europe of its worst democracy-deficient offences. His understanding rests on the idea that our commonly developed democratic standards, stated in a common European document, the ‘Copenhagen Criteria’, apply to states rather than all governing entities, and hence cannot be applied to the Union. Added to this, is the idea that sovereignty, the ability of a government to exercise control over any aspect of public life, according to the rules laid down in the constitution, should be abandoned. Finally, we have the embrace of the Roman-esque, bread-and-circus politics, assumed as necessary on the implicit assumption that real democracy as understood at the state-level requires an ethnically homogeneous dêmos. To return to the matter of control of the Union, it is well-documented that the condition of the Union’s control of the boundaries of its competences – enumeration – is notoriously weak. Taking from Weiler, the Court of Justice, responding to and urging on the political developments in the Council coming to a head in the 1966 Luxembourg Compromise, has effectively not policed the boundaries of the enumeration of powers between the Union and the member-states since the 1970s, so that almost any competence of national governments is effectively within the scope of Union-reach. This is legally enabled by the so-called ‘flexibility clause’, retained by the constitutional treaty, and built on with the so-called ‘shared competences’, which the Union and the member-states share until the point one legislates in a certain policy-area, after which the other side may not legislate in. The flexibility clause itself states that the Council may decide to legislate in areas not explicitly conferred upon the Union in the interest of ‘attaining the objectives of the Constitution’. In the 1970s, the European Court was given the opportunity to better define and perhaps limit this clause of the treaty; it declined, and since, control of the Union’s competences has been in the hands of the national ministers in the Council alone. At the base of this, and of the whole treaty’s take on the Union’s democratic problems, is the idea that a ‘people’s Europe’ should benefit the citizens. Not that it should answer to the people as its citizens, or serve them, or exercise their will. This links with the understanding of democracy adopted by Piris and the majority of the Union’s functionaries in several ways. At the base of this, and of the whole treaty’s take on the Union’s democratic problems, is the idea that a ‘people’s Europe’ should benefit the citizens. Not that it should answer to the people as its citizens, or serve them, or exercise their will as determined in democratic debate, public opinion and elections, among other channels, but that it should benefit them. With this in mind, all that matters in the ‘Europe-will-be-judged-by-the-results-it-delivers’ approach, is the efficiency with which the Union delivers results and can demonstrate them. The language of ideas and principles is gone, particularly those of democratic government, which include the separation of powers, the enumeration of powers in a clear, codified federal settlement, and the control of governing institutions by citizens who form a dêmos and intend to govern themselves. According to Piris, it was too difficult to draw up a comprehensive demarcation of competences and instead the exclusive, shared and supporting categories will have to do, throwing the federal idea of an agreed and fixed settlement of power established at different levels, rather than one level (the national) granting and conferring powers as it sees fit, out of the window. This is the language of devolution, where powers are granted by central authority to peripheral institutions so long as this serves the interest of the central authority. Conversely, powers are being devolved up to a central bureaucracy rather than down as they are in Britain. The effect on democracy is the same however; citizens do not have real control over the demarcation of powers as in a federation. They cannot rely on power to remain fixed in certain places unless a major effort is made to change the settlement. Power is granted by a single entity, where power resides exclusively, to other areas, without concern for democracy, or subsidiarity, or self-government; but with concern alone for the ability of that single entity – in our case the national governments – to shape the rules of the whole affair to their favour. Thus, the Union is still stuck in its cartel-like administrative origins, thinking sectorally and in terms of management and appeasement, rather than openness to citizens and control of power; where not democratic legitimacy but pure efficiency is the sole priority of government; the function of government stripped of its normative content. Thus, the Union is still stuck in its cartel-like administrative origins, thinking sectorally and in terms of management and appeasement, rather than openness to citizens.. The assumption is made that member-states becoming part of a wider federal entity would necessarily entail a weakening of their national identities and cultures; that a constitutional European federation would amount to “attempting artificially to build an improbable ‘super-nation-state’”. This is based on the idea that true a sovereign democracy requires an ethno-culturally homogeneous dêmos in order to function properly, and so if the EU were to become a federal state, it would have to homogenise the member-states in some way. This, I believe, is not a truth that Europe must accept. A citizenry that transcends nationality, a dêmos without éthnos, that is truly transnational, is in fact possible. Accepting otherwise, that for democracy to work it must be national and ethnically homogeneous, is both closed-minded and unimaginative, failing to meet our ancestors in envisioning new forms of government, and failing to rise to the occasion of the challenges of our modern world. Ethnic homogeneity is neither something to be desired, nor to be expected in the coming years and decades. A democracy must be capable of going beyond it, that crosses borders in the spirit of transnationalism rather than inter(between)nationalism. The result is that sufficient control is supposed to be exercised through national ministers in the Council, national parliaments and regional bodies in the Committee of the Regions. On the first, the idea that national ministers are capable of exercising democratic control, effectively over themselves, is ridiculous. Ministers sit in the Council of the EU, a legislative body, as well as their national ministries. In their ministries, they answer to their Heads of State & Government, who sit in the European Council, an executive body, which determines the general direction of the Union. Hence, they both write policy and scrutinise it; executive and legislative power combined, all supported by a single, integrated bureaucracy. Headed by the European Commission but primarily manned by national civil services under the control of national ministers, this machine is totally under the control of a small group of people able to pull all the necessary levers to command an entire continent; something totally impossible at the national level, with all its transparency and parliamentary control. Hence, they both write policy and scrutinise it; executive and legislative power combined, all supported by a single, integrated bureaucracy. Added to this is the comitology procedure; Piris explains it as effectively the legislation passed by the Council but implemented entirely by the Commission, with the potential for amendment by the Commission. Control over this procedure is given to informal committees nominated by the member-state governments; ‘representatives’ who are mid-level national and EU bureaucrats, and an array of ‘private bodies’ – the vast majority corporate lobbyists - with special access to the institutions, neither at the national nor supranational but ‘infranational’ level. With such weak political mobilisation at the European level, corporate interests have mobilised instead with great ease and to great effect, a direct result of cartelism. To think that national parliaments can make up the difference in this enormous chasm of accountability and legitimacy is ludicrous. With no guidelines on how to judge ‘subsidiarity’, no specific legal support or resources for the task and very little time to review the entire EU legislative programme in addition to their national workloads, it seems impossible that national parliaments could do a satisfactory job. And this is putting aside the fact that the Commission isn’t obliged to change its proposals, and the Court of Justice has shown itself unwilling to police enumeration. What goes for national parliaments goes doubly for regional bodies. A citizenry that transcends nationality, a dêmos without éthnos, that is truly transnational, is in fact possible. Other criticisms have come thick and fast from other observers of the constitutional treaty. An idea which sums it up in its entirety is Fossum and Menéndez’s charge of ‘octroyé constitutionalism’; that is, ‘granted’, in the sense that constitutional questions are answered “in the name of the people but not with them”. You can see this in much of the language of the Declaration, the treaty and Piris’ defence; lots of statements about what should be done or what has been done on the peoples’ behalves, but no recognition of the fact that they were largely absent from the proceedings, or inkling that they should have been present, in order to legitimately call this a constitution. In the same vein as this is Weiler’s earlier observation that people in the Union may be subjects of European law but that this does not make them European citizens: citizens are not only subject to the law but are, through our various methods, authors of the law. We are not granted rights, but empower institutions to guarantee the rights we determine ourselves. This is not the European reality, and certainly not that envisaged by the octroyé constitutional treaty. Müller notes the double-intent of the European elites, who envisaged a treaty written by them but named ‘constitution’ in order to conjure up legitimacy – some sort of magic ‘spirit of Philadelphia’, imbued by the will of ‘we, the people’ in theory if not in reality. The intention was to create the effect of a constitution, simply by being named one, without actually having to undertake a constitutional process that would cede control of the European construct to the citizens from whom they’d kept it for so long. They created “expectations they were neither able nor willing to fulfil”. A key element of this misunderstanding was the maintained air of mystique, complexity and open-endedness which left many citizens unable and unwilling to grapple with it. Müller argues that even if the idea of a continuously developing Union could be a good one, making it so indeterminate and complex leaves it distant and incomprehensible to its very citizens, which is a failure in terms of democracy. The intention was to create the effect of a constitution, simply by being named one, without actually having to undertake a constitutional process that would cede control of the European construct to the citizens from whom they’d kept it for so long. This final criticism brings us back to our initial position; the failure of this document was due to an attempt to write a constitution without democracy, and more fundamentally, without politics at all. Luuk Van Middelaar notes on the first matter that the Spanish government, in their main push for citizenship, had their eye on ‘Roman’ benefits for nationals rather than the creation of ‘Greek’ democratic legitimacy; already a poor start. Again, being presented ‘octroyé’ unforeseen new citizenship without consultation or clarification did not improve but if anything undermined the Union’s legitimacy. When the time came, these citizens were forced in alongside the states in the gap filled by the pouvoir constituent, recognised as citizens but not a people to preserve the illusion. However, they didn’t fit: unbeknownst to them they had constituent power and a new constitution. At this range the illusion of constitution without constitutionalism could not last long. Unease at the new constitution they had no real power over, and its uncertain place alongside the national constitutions, led to a rupture which killed it. With the reversion back to treaty, the citizens were once more stripped of their constituent power; Europe was unprepared for democracy it seemed. At its first attempt at politics, it failed. One of the keys to this failure as Marquand points out is the total absence of depth, complexity or values from the European political discourse on the Union, and particularly in this instance . These concepts had evaporated in the fin-de-siècle euphoria of bread and circuses; the euro, the single market, the Erasmus programme. The related political theory of neofunctionalism, that integration is a functional process advancing systematically from one economic and administrative sector to the next, has no place for political debates or values, and nor did its adherents want them. Ultimately, a constitution in this context serves a purely material purpose – it is a series of rules. This was not the intention of the neofunctionalist méthode Monnet, however as Marquand says, the means have eclipsed the ends . A final key point I will make is on eclipsed ends. One of the principal ends of the European Project was the expulsion of war from the European continent, and with it, I believe, the transformation of relations between the nation-states of Europe into something permanently peaceful. And not only permanently, but ones which value peace not for the sake of commercial benefit but for the moral value of the preservation of peace and the ousting of violent conflict. In other words, the end of realpolitik, of rule-through-strength, of militarism, interventionism and belligerence, and the realisation of the pacific federation from Kant’s Perpetual Peace. The chosen method of this was economic integration that would ultimately inspire a post-national Europe; not post-identity, or post-particularity or post-diversity, but post-nationality in the sense of the aggressive, ethnically-defined, uncritical form of identity that nationality has embodied. This has been abandoned by the European elite who devised the Constitutional treaty and subsequent Lisbon ‘Reform’ Treaty, in two key ways. First is the extensive effort being made to develop tools for Europe to project its influence throughout the globe, by harmonising its military capability and its coercive means; in other words, Europe’s replication of the American, imperial example of action on the world stage, and the acceptance that Europe is 1) subordinate to America and more dishearteningly 2) unable to produce an alternative to the Hobbesian logic of Realpolitik and ‘realism’. Second, given every opportunity to reject this gloomy vision, instead of accepting in full the principle of the equality of member-states of the Union, it failed to meet that expectation. The principle of the equality of states is established in international law; it was constitutionalised by the American states in the foundation of their federal union, because these are not merely states but peoples of formally independent democracies reconstructing their sovereignty. Hence, the realpolitik-concept that the stronger states should be recognised as stronger within the Union is surely out of the question, larger population or not. And yet this confirmation that the peoples of these democracies are equal was too much to ask of the large states. Instead, the Union neither fulfils proportional nor equal representation, and its largest member-states are unwilling to commit to the founding principles of the Union that large states should not be able to wield more power over smaller ones, in realpolitik or in institutionalised form. The Kantian ideal of the pacific federation lies discarded; we are not equal participants in this endeavour, the big states lead, and the small ones follow. ‘The strong do what they can and the weak suffer what they must’. Exactly the ideas the EU was supposed to refute and overturn; they now sit, rotting at the heart of the edifice, here in the legal foundations of the Union. Exactly the ideas the EU was supposed to refute and overturn; they now sit, rotting at the heart of the edifice, here in the legal foundations of the Union. Europe’s contradictions are made manifest in this affair – constitution and treaty being forced together. They began in the realisation that a constitutional order had grown from one founded by international treaties. The judgements of the Bundesverfassungsgericht tried to put the genie back in the bottle, by proclaiming the Union an international order because it could never become a true constitutional order. However, the judgment’s short-comings undermined itself. The fact is, we have an order in Europe where law is written and citizens are subject to it, without this order having a democratic, constitutional foundation. This has bred some of the worst failures and excesses of the Union, from unaccountable authority, to disregard of democracy and a weak understanding of democratic theory, to an abandonment of its principles in the pursuit of power. Democracy is the only hope for the European Union - its existence as is will only destroy itself. Europe will be democratised, or it will disintegrate, crumbling under the weight of its own failures and illegitimacy. Europe has long needed such a union, to end its eternal destructive conflicts; however, that union cannot exist like this. How it could exist, will be elaborated on in another essay. But the current paradigm has failed, and cannot be salvaged. Grimm D. ‘Does Europe need a Constitution?’. The Question of Europe ed. Anderson P & Gowan P. London: Verso. 1997. Piris J.C. The Constitution for Europe: A Legal Analysis. Cambridge: Cambridge University Press. 2006. Weiler J.H.H. The Constitution for Europe: "Do the New Clothes Have An Emperor? " And Other Essays on European Integration. Cambridge: Cambridge University Press. 1999.